Governor Peter Shumlin, state workers and a host of state and local dignitaries gathered Wednesday for a ribbon cutting at the new Bennington court and state office building. About 130 state employees have been working in prefab modular offices since 2007. That was after a rash of asthma-related illnesses among workers – including cases of a relatively rare disease called sarcoidosis – forced the old state building to shut down. Workers in the building had complained for years of headaches, bad odors, and windows that didn’t open. The governor – who was a state senator when the problem came to light – praised the workers, and their union – the Vermont State Employees Association – for making their complaints heard. 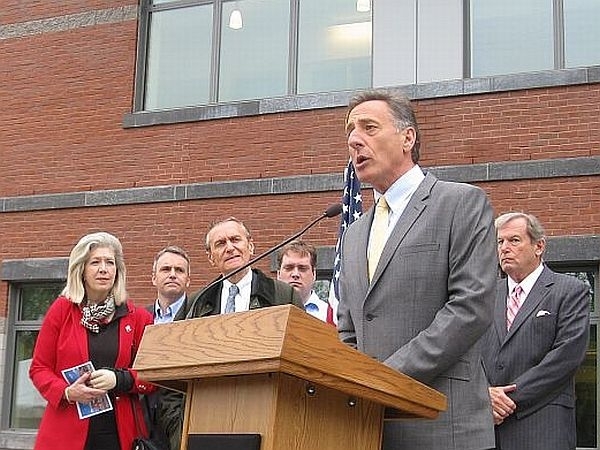 "There was a sense among many of us in the legislature that something had to be done," Shumlin said. "And the only way it was going to change was if legislators worked together with local leaders, select boards and others, to raise the level of dialogue about the fact that we were leaving sick employees in a sick building because we were afraid that it was going to cost the state some money." The new complex cost almost $13 million to build. But its geothermal heating system and green design are expected to save $180,000 annually in energy costs. It houses the Vermont District and family courts, probation and parole, state human service agencies and the departments of labor and aging. Construction is well under way on Bennington’s new state office and District Court building. Officials say the new building should be ready by December or early January.